Bunheads is the opportunity to live vicariously the life of a ballerina. As someone who was born with three left feet (you may not think that's possible, but if you see me dance, you'll understand), it is wonderful to become a dancer for 300 pages. In Bunheads, the reader follows Hannah, a 19 year old professional ballerina, who lives, sleeps, eats, and breathes ballet. It is such a foreign world that you feel like you're reading a fantasy or visiting a different country. Sophie Flack does a fabulous job of setting up the ballet world. Ostensibly, Bunheads is about a young ballerina who thinks only of ballet until she meets a handsome, intriguing guy "from the outside" who introduces her to the real world, at which point said ballerina needs to decide whether she would rather continue ballet or venture out into the big world with lover-boy. But if you're looking mainly for plot heavy romance, go elsewhere. The rather unoriginal plot is the least interesting thing about Bunheads. Where the book excels is the immersive ballet experience. Sophie Flack is a retired professional ballerina so she knows of which she writes. The book is supposedly mostly autobiographical. The world of professional ballet is one of sweat, tears, joy, competition, cruelty, hard work, heart break, opportunities, and ultimately the love of dancing. I loved how Hannah seemed representative of the typical dancer. She's not the star, but she's not the weakling. We saw day in and day out how much she sacrificed for ballet. She is 19 years old - old for YA - but in many ways as emotionally immature as a 14 year old. She has not really lived. She works incredibly hard - enduring hours of intense rehearsals only to finish it off with more exercise and a limited diet. All in the name of earning a better role. The world of ballet is unimaginably competitive. Hannah's only friends are her co-dancers, who are also her competitors. The cattiness can get extreme. We see every girl, Hannah included, smile to a girl's face only to talk about her behind her back. A lot of reviewers criticize the book for featuring a "mean girl" main character, but I don't see it that way. With the exception of a few saints, I think most of us have talked about other people behind their backs, be they friends, family, or enemies. It's not a positive attribute, but it is a real one. I am very pleased to see a protagonist who is a fundamentally nice girl but isn't perfectly kind. In fact, I think it's one of my favorite parts of the book, simply because it's different. But the characters aren't always catty. There are many scenes where you see how the characters care for and support one another. Bunheads is a endearing, fun book that takes you behind the scenes of a professional ballet. Regardless of the plot, the cultural experience is worth the read alone. I loved how Sophie characterized the world as demanding and unforgiving, but also showcased the beauty of dancing. We understand why Hannah stays with ballet, because she exudes her love for dancing. And we feel it too. Bunheads is one of the best athletic books I've read in a long time and I highly recommend it. Nice review. I loved getting a glimpse of the life of a ballerina when I read this. I wasn't a huge fan of the romantic plot, but I still enjoyed it. Bunheads sounds so, so good to me. You did a lovely job in your review - thoughtful, diplomatic, and detailed without it becoming just a summary. Thanks! Did you hear that it will likely become a TV show soon? Great review and this book reminded me of Center Stage the movie...I love the glimpses of ballet life too. Glad you enjoyed this one Alison! It wasn't for me so much, but I agree that the portrayal of the ballet world was fascinating and beautifully done. I can't imagine being in an environment that competitive for so long, I would have broken down long before Hannah! Now this book really sounds like something I'd enjoy. Thanks for your detailed review! I love looking at different artists and athletes lives and living vicariously through them. It's almost like seeing your own dreams come true. I love the world of dance. I get so completely absorbed when I'm watching dancers perform, but for some reason I have a hard time reading about dancers. But yes, I've heard that the whole ballet culture is unique and pretty brutal. I'd like to learn more about it so I'm glad this book does provide that insider look. What little girl doesn't dream at one point of being a ballerina! Great review! I've had this one on my wishlist since it was released. It sounds like a great read. I love the cover. Great review! Thanks for the review! I really would like to read this book, being an ex-ballerina. I'll definitely put it on my TBR now! I was drawn to this book due to its cover at first but reading your review makes me want to read it right now! I have absolutely no grace whatsoever so ballerinas have always been really intriguing to me. I love that you said it was so immersive and that the character was fundamentally nice but not perfect. I think that's a tricky balance to do and many authors don't do it well. I loved reading your review so much, thank you! Oh, a GOOD ballet book. Awesome! 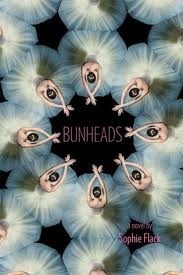 Bunheads definitely sound pretty amazing. I really hope there is character growth on Hannah's part! I danced for 12 years, mostly ballet, and although I was never the star, I loved it and I miss it! I'll have to check this one out for some nostalgia! And I agree with you about how we've all got our flaws and as long as the characters grow within the book, I'm happy! This is sitting on my shelf. I really need to read it before I get rid of it! I loved this book so much! It was probably one of my favorites for 2011. I loved the character of Hannah so much - I think there's really something about living in such a competitive environment - if that's all you know, you probably don't question it. I do ballet do but not at competition level, it would be awesome to immerse in it professionally for 300 pages as you say! I have mixed feelings about the idea of featuring a "mean girl" but I guess I can't form an opinion until I read it - an interesting idea to explore, for sure. Loved the review! This book was so related to me since I too was a dancer once, back in high school! The title alone makes this very intriguing, but your review added to that makes me want to read it! Thanks for an excellent review! Great review and the title cracks me up. My daughter is a dancer and it is a cruel, difficult passion but she loves it. I'll have to find a copy of this book for both us to read. I read this book recently and agree almost completely with your review. I loved getting into the world of ballet, which I never really would have otherwise. And to be honest I never really noticed Hannah's cattiness, I guess because of the way it was written it never seemed odd to me. Looking back I can see it there, but again it just felt normal. Sounds interesting. I like the cover a lot as well (it's unique & I'm so tired of the same covers over & over). I never thought of Hannah as a mean-girl; it didn't seem like a defining characteristic of hers. I also was not impressed with the romance, definitely the weakest aspect in comparison to the immersive ballet part.